If dreary winter weather is getting you down, lift your spirits by adding bright, zesty citrus fruits to your every day cooking. The new year is well under way and already we have visions and hopes of Spring. 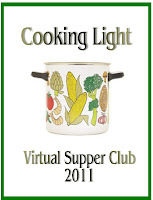 We are so glad you have decided to join us once again for our Cooking Light Virtual Supper Club. This is a monthly event where 5 ladies and now one gent in two neighbouring countries get together to create a delicious meal with a theme in mind. We are now in our second year and continue to share a love for Cooking Light magazine which has an emphasis on healthy eating and living. This is a team effort where we combine what Cooking Light readers like best...good food with great company!!! Every month millions of readers turn to Cooking Light for recipes, advice on nutrition and fitness. This months theme " Notes of Citrus"was chosen by long time member Jamie following her Floridian roots. We've mixed and matched these tropical-flavoured recipes for an aromatic menu that includes a splash of sunshine from start to finish. If you have a dish that would fit into this months theme please feel free to add your link at the bottom of this post with the Linky Tool. Next month we will be highlighting local ingredients with "100 Miles of Flavour"
For my contribution this month I chose the seasonal blood orange. There is just something about them that appeals to all of my senses. They sport a thin, red-blushed orange skin, with flesh that ranges in colour from pink to brilliant red to burgundy. They're tart-sweet and slightly berry-like in flavour. The two most popular varieties are the dark-fleshed Moro and the delicately flavored Tarocco. The former is available from December to March, and the latter from January to May. Because the orange tree can simultaneously produce flowers, fruit, and foliage, these succulent fruits have long been associated with fertility. Although some are grown in California, most blood oranges come from Mediterranean countries (Southern Italy in particular) and are often considered to be among the finest dessert oranges in the world. Imagine picking one right from the tree!!!! The brightly coloured outer layer of citrus fruit, the zest, contains scented essential oils that impart a handsome flavour to dishes. When a recipe calls for strips of zest, a vegetable peeler works very well. But for fluffy, grated zest, try using my favourite kitchen gadget a micro plane zester. Years ago I remember watching an episode of Martha Stewart where she used a woodworkers microplane to zest her lemons. I am sure this is where the idea came from to create a microplane for cooking. Best invention yet! When juicing your citrus to extract the maximum juice, either roll your citrus fruit around on a flat work surface, pressing down firmly with the palm of your hand (this method is particularly useful for limes, which can be hard to squeeze), or warm through gently by dropping into a pan of hot water, popping into the microwave for a few seconds, or even placing in a warm oven for a minute or two. I use the microwave method myself and there is never a drop of juice wasted. One pound of fruit equals about three medium oranges and one cup of juice. Oranges are rich in antioxidants which are vital for healthy cells, including vitamin C, which aids in healing, boosts your immune system, helps your body absorb iron, and even helps reduce the risk of cancer. One tasty, medium-sized blood orange will provide you with 70 calories, 3.0 grams of fiber, 1.0 gram of protein, and no fat, sodium, or cholesterol. Now lets see what we have cooked up for you for this months theme. First of all Mary Ann of Meet Me in the Kitchen starts our Notes of Citrus menu off with a tantalizing appetizer of Lime-Spiked Black Bean Dip. This dip is so easy and perfect for our virtual gathering. It tastes best served at room temperature. Next Sandi of The Whistlestop Cafe wowed us with our main event Lemon Sage Chicken. The bright flavors of lemon and sage transform bland chicken breasts in this simple and fast marinade. Plan on marinating the chicken at least 4 hours before grilling or baking. To amp up our Notes of Citrus menu Jamie of Mom's Cooking Club compliments the menu with Mixed Lettuce, Pear and Goat Cheese Salad with Citrus Dressing. Thanks for choosing this months theme Jamie. Our taste buds definitely needed to be awakened like the buds on the trees. Jerry of Jerry's Thoughts, Musings and Rants brings the King of side dishes with Braised Fennel with Orange. Orange juice and rind delicately flavour wedges of fennel. This slightly sweet side is the perfect foile for the rest of our menu. Roz of La Bella Vita ends our meal with that WOW factor with an absolutely stunning Nathan's Lemon Cake. Cooking Light adapted this recipe to trim the fat and calories, and it's still a moist, lemony finale...gorgeous too!!! To accompany our meal I brought along an outstanding drink with Spanish roots a Blood Orange Sangria. Any good-quality, fruity red wine works well in this cold sipper; a combination of pinot noir and Beaujolais is particularly good. The vermilion flesh of blood oranges is lovely. But if they're not available, substitute navel oranges. The only change to the recipe is that I added the juice of 3 blood oranges. They were so juicy I needed to wash the wall!! Combine all ingredients in a large pitcher, and stir until sugar dissolves. Cover and chill 8 hours or overnight. Discard cloves and cinnamon sticks. Pour sangria into individual glasses, including the fruit. Oh That recipe can come in handy when having a party! I am always looking for a great recipe for cocktails! wonderful sangria..
What a beautiful sangria from blood oranges of all things! What a great cocktail/beverage recipe for the citrus season, for the Cooking Light Virtual Supper Club, and for all of your readers! CHEERS! Hope you are feeling better and that you got a Linky code for your blog! Super job getting everything organized; I'll have the cake up tomorrow, the 2nd. I'm so excited to make a more healthy cake to stay on track! love the blood oranges and spice! I can't wait to try this sangria out. Mmmhhh, a drink that I love. Yours looks wonderful. What a wonderful citrussy feast. I love all thing citrus but sadly my husband does not which is rather frustrating. Your sangria looks so tempting (even at this time in the morning) and makes me think Spring may be on the way! I linked up my sweet and savory orange salad. This is the second time I've used Linky and am finally getting the hang of it. Beautiful. This sounds like the perfect complement to a delicious meal. That cocktail looks very snappy! Homemade sangria is bliss. Can't wait for the blood oranges to arrive here...any day now. 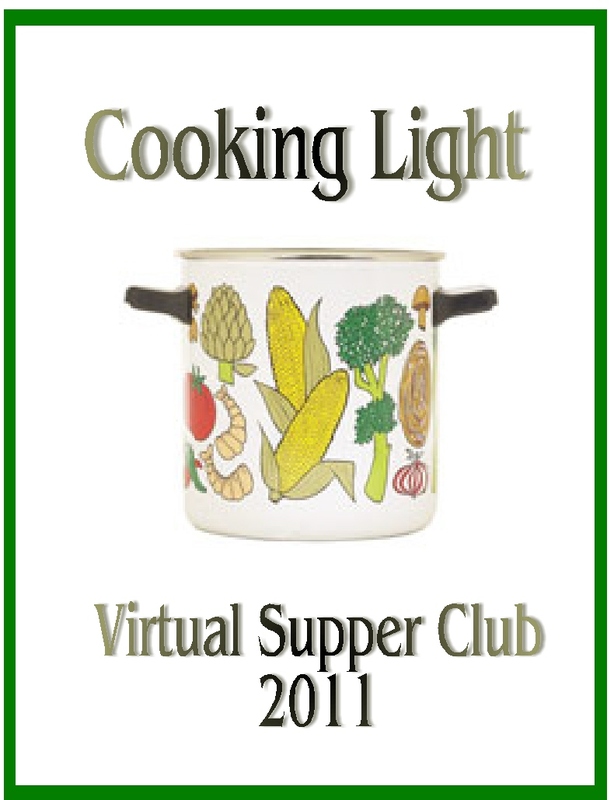 Thanks for bringing it to the virtual supper! 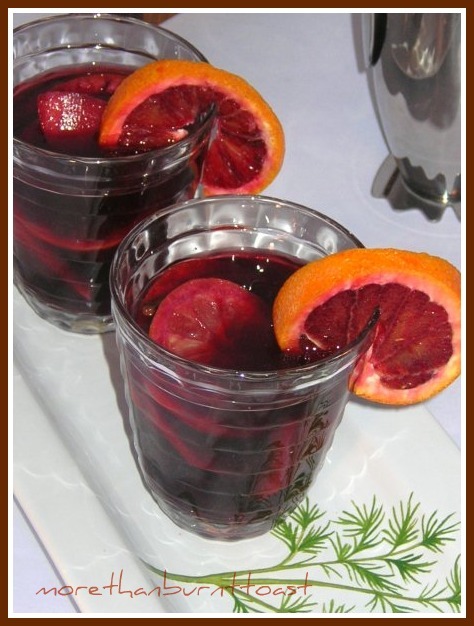 A gorgeous sangria, such a deep dark red beautiful color with the blood oranges! What a lovely colour! Mmmm yum I could just drink one of those now. I like the way you think with serving portion. I so enjoy these challenges, but I never know how to be part of them..Pass a glass, please! What a great drink! It sounds delicious and very tempting! I do love cooking with oranges. Citrus was a great theme! Some of my favorite recipes I have ever made have been orange flavored such as my blood orange glazed duck breasts, bourbon-orange chicken thighs, bourbon orange cake, and ginger-creamsicle spice muffins . I'd wash any of that down with that sangria. Oh, how I love sangria and this version looks terrific! Blood red oranges, blood red wine, what a perfect combination. I have to say, without citrus, I would absolutely NOT be able to make it through the winter! I love your sangria. Seems like the perfect way to cap off a long day of classes! What a stellar round up with incredible ideas. Your Sangria looks divine. I crave anything citrus right now in the Edmonton and will be visiting some of these sites shortly! I think in my house it would only serve 4 :) Lovely creation. So refreshing. I love blood oranges. Your Sangria definitely puts my in the mood for spring! I don't know why I never think of making sangria in the winter when the citrus is in season. The blood oranges are perfect for it! HI Val, All linked up! All of the recipes sound so incredible and I can't wait to try them all! What a wonderful theme! We loved, loved, loved this lemon cake! My mother, a true lemon lover, if there ever was one, thought she was in heaven! WOW - this sounds like the perfect thing to sip while enjoying a good meal of some fine chatter with freinds . . . another great addition to the menu. I've never had blood oranges Val. But your cocktail sounds perfect. A great way to enjoy citrus flavors. Sangria and spring definitley go together. This looks fantastic! Lovely event, will see if I can come up with something. Isn't that a gorgeous sangria!!!! Perfect, Val. For once, my citrus post coincided with something you're doing! This is perfect Val! I planned on making Sangria this weekend when we are invited to dinner at some friends' house! What a beautiful drink! Citrus is so good right now and I can almost taste all the wonderful flavors in this blend. My market doesn't have blood oranges but I bet Whole Foods does. I haven't had sangria in far too long - this looks wonderful. I love sangria and have just discovered blood oranges this year. What a great combination! Oh Val...blood orange sangria! 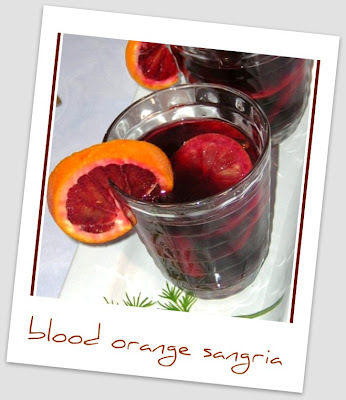 I love sangria, never thought to make it with blood oranges, which I also love! Looks amazing, and so vibrant! !